'The strengths of this text are many. It has breadth and diversity in its content yet is presented in bite-size chapters. For those wishing to know more, it offers signposts to the relevant literature. The contributors have been carefully selected for their specific perspective yet these have been skilfully inter-related by the editors. It is now some 11 years since the first edition of this text was published. In my view, this second edition was worth the wait' - "SCOLAG Journal". 'This has been a ground-breaking book!and I whole-heartedly welcome a new edition'- Professor Len Barton, School of Education, The University of Sheffield. 'It is a really well-structured book which has been very popular and widely used by students! Its great qualities are accessibility and diversity of contributors' - Jenny Corbett, Institute of Education, University of London. 'This book would be a valuable resource to students of disability studies and to health and social care staff and other professionals who work with disabled people' - "Disability and Rehabilitation". The Second Edition of this landmark text has been revised to provide an up-to-date accessible introductory text to the field of disability studies. In addition to analysing the barriers that disabled people encounter in education, housing, leisure and employment, the revised edition has new chapters on: international issues; diversity among disabled people; sexuality; and, bioethics. Written by disabled people who are leading academics in the field, the text comprises 45 short and engaging chapters, to provide a broad-ranging and accessible introduction to disability issues. 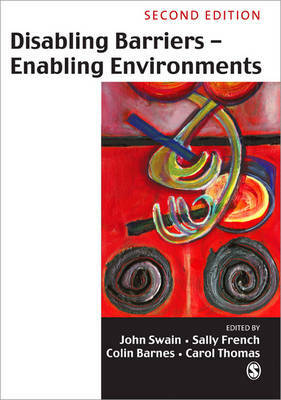 "Disabling Barriers, Enabling Environments" is an invaluable resource for both students and practitioners alike. It is an ideal text for undergraduates and postgraduates taking courses in disability studies, as well as disability courses in social work, education, health studies, sociology and social policy.